TotalFinder - alpha call for testing! TotalFinder is my attempt to make Finder.app better for programmers and Mac power users. I want it better for myself! Do you know Visor? TotalFinder is also implemented as a SIMBL plugin which extends Finder.app functionality. TotalFinder works in Snow Leopard only. The reason is that Finder.app has been rewritten into Cocoa in Snow Leopard which finally made this hacking possible. It was tested on my MacBook Pro 17" with 10.6.2 OSX running 32-bit kernel. There is a chance that during startup TotalFinder crashes and brings down whole Finder.app. The problem is that there is a process continuously starting Finder.app if it is not running somewhere in OSX. So it ends as an infinite loop of Finder.app starts and crashes until you remove TotalFinder SIMBL. You were warned! Stay sharp! And you can also see that I'm planning to start selling this at some point in the future when the thing gets more stable. How does .DS_Store redirection work? I'm pretty excited about solving the problem which has been bugging me for more than two years since the day I switched to Macintosh. Every single day! Yeah, kernel extension sounds scary. But I didn't find a better solution in user-space. FSEvents are not precise enough (it just reports "something was changed"). BSD kqueues must be registered on per-file basis, so it is not usable in this scenario. At the end of the day that kernel extension turned out to be a really light-weight solution. I use KAUTH API to monitor kernel filesystem events. I do it only if TotalFinder is connected and only for renames and deletes. Testing is a simple C-string comparison and sending notification via socket. 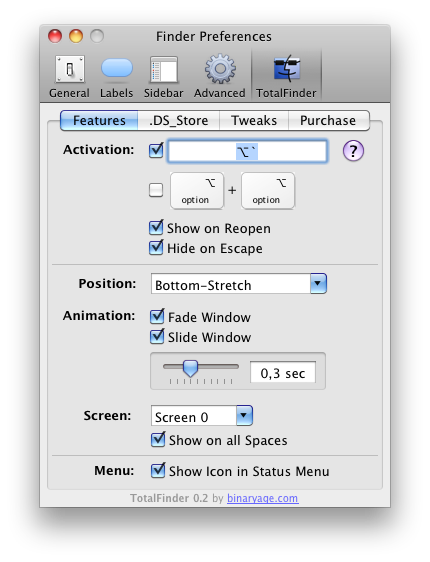 .DS_Store file is created when you modify Spotlight comment on a file This is caused by mdworker process and has no direct relation to Finder.app process. It seems like Apple engineers scattered DS_Store functionality into more applications. I'm still investigating this. Temporary workaround is not using these Spotlight comments. Which is my case anyway. I hope this is enough info for you to get started playing with TotalFinder. Your feedback is appreciated! I've fixed tons of Visor bugs and made it possible under Snow Leopard. Now it is your turn to help me roll this out :-) Thanks!